Dr. Pierson updates her site as new information comes to light. Therefore, it is suggested that you visit her Vaccine page at catinfo.org and scroll to the bottom for the "updated" date. If it is more recent than Novemer 2016, then please read the version at catinfo.org. Dr. Pierson has over 28 years of experience as a veterinarian and she is passionate about feline medical care and nutrition. Dr. Pierson's website catinfo.org articles regarding cats and their health. This article has been reprinted in its entirety with permission of Dr. Pierson. Please click on the links below to read more about the key issues associated with vaccines. Several important statements will be repeated in different sections in case the reader does not review the entire webpage. IMPORTANT UPDATE - October 2014: Merial has recently brought to market a new PureVax rabies vaccine that is non-adjuvanted and is labeled for 3 years versus their original (and still available) PureVax rabies vaccine that is labeled for 1 year. The 3-year product is the rabies vaccine that I strongly recommend. Sadly, I have lost four of my cats in the past year. They ranged in age from 18-20 years. Three succumbed to cancer and one passed away from acute kidney failure. Why am I bringing this up? It is because on the day of their passing, I drew blood for a vaccine titer from all of them. None of my cats had been vaccinated for FVRCP (herpes, calici, and panleukopenia viruses) since they were kittens and I wanted to know what their antibody level (titer) was to panleukopenia – the dreaded and often fatal 'cat distemper' virus. Result: They all had what is considered to be a protective titer for the panleukopenia virus. Please keep this in mind as you read about duration of immunity (DOI) below. A vaccination is a preparation of microorganisms (pathogens), such as viruses or bacteria, that is administered to produce or increase immunity to a particular disease. There can be no disputing that vaccines save lives but they also have the potential to cause serious side effects which will be discussed on this webpage. consideration of the duration of immunity (DOI) information that is available to us. This webpage discusses vaccine protocols that are within my comfort zone but may not be within the readers'. It is also important to understand that a discussion involving FVRCP (herpes, calici, panelukopenia) and FeLV (feline leukemia) vaccination is separate from one discussing rabies vaccination. This is because rabies vaccination is legally required in many areas of the world. Regarding DOI data: Unfortunately, many veterinarians are not considering the facts and are recommending unnecessary vaccinations. The subject of vaccine administration is one of the most controversial topics in human and veterinary medical literature, making it a common area of debate - and stressful decision-making - among parents and pet owners. How often are you getting vaccinated for measles, mumps, chicken pox, tetanus, etc.? Yearly? Every 3 years? So why aren't more people questioning the reminder cards that many veterinarians send out asking for the pet to be brought in for yearly vaccines? More to the heart of the matter, why are many veterinarians ignoring the current vaccine guidelines which call for a longer period of time between vaccine administration than has been the 'standard' for many years? The evidence-based recommendation/suggestion to vaccinate less frequently than we have been doing for the past many years came out of Colorado State University approximately 1998 so this is not something new. However, the members of the veterinary profession have been extremely stubborn about embracing new evidence-based vaccine protocols. These 'newer' guidelines are based on DOI (duration of immunity) studies showing that it is not necessary to vaccinate cats as frequently as they have been in the past. In fact, the DOI studies show that it is not even necessary to vaccinate as frequently as every 3 years for FVRCP. See the comments about my personal cats at the top of this webpage. It is very important to understand that the current guidelines state that the FVRCP combination should not be given more frequently than every 3 years. That is not the same as stating "these vaccines should be administered every 3 years." This is a significant point of confusion among some veterinarians and most lay people. The guidelines are worded in such a way as to invite vaccine intervals that are even longer than 3 years. A cat's immune system is not any more 'forgetful' than a human's immune system. In other words, there is no reason to believe that they need to be vaccinated so often. Their immune system, to the contrary, has a very good memory. For many years, humans have thought of vaccines as 'all good and no bad' but that line of thought cannot be further from the truth. Given the serious side effects that can manifest themselves after a vaccine has been given, people need to start applying more critical thought when making decisions about vaccinations protocols. It is very important to understand that no vaccine is 100% safe. However, it is also very important to understand that vaccines save lives and there can be no debating that fact. These two facts, along with other factors discussed on this page, enter into every decision we make regarding how we vaccinate our cats. I wish that I felt comfortable saying "ask your veterinarian for the best advice regarding the vaccination of your cats", but I don't. This webpage is not intended to be a comprehensive discussion on all matters involving vaccinations but, instead, will cover some vaccine basics, and my personal views on the subject - including how I vaccinate my own cats. These veterinarians acknowledge that the current suggestions/package labels do not reflect the fact that challenge studies have shown a very long duration of immunity (DOI) - lifelong, for some diseases, from just a single, properly-timed, vaccine. Unfortunately, it has been hard enough to get veterinarians to switch from annual vaccines to the current 3-year protocol so it is going to be an uphill battle to get them to vaccinate even less frequently. Therefore, I do not see changes in the AAFP suggestions coming anytime soon. To put this in perspective, I will note, again, that the recommendation to go to a 3-year vaccine protocol came out of Colorado State University more than 18 years ago, yet there are still many (~50%) veterinarians administering annual vaccines. This reluctance to change is especially true of the older generation of veterinarians (myself included having been involved in this profession for over 40 years) who lived through a time when the mortality rate from rabies, distemper, etc., was very high. Vaccines came along and saved lives - no question - but it is time to start paying more attention to the current DOI studies - some of which have been available for many years. I urge the reader to take the time to do their own research into this area and not necessarily rely only on your veterinarian's recommendations. It will be up to the reader to decide how they want to handle vaccine administration in their ow kittens and adult cats for FVRCP and FeLV. Yes, I am shouting about the last issue. To be fair, adjuvanted vaccines are not the only substances that can cause sarcomas. Even non-adjuvanted (modified live) vaccines, as well as other injectable drugs, can cause these tumors. This is why the acronym "VAS" (Vaccine Associated Sarcoma) is being dropped in favor of "ISS" (Injection Site Sarcoma). That said, at this time, it appears that adjuvanted vaccines have a higher risk rate of sarcomas when compared with non-adjuvanted vaccines. Do not assume that your vet is using non-adjuvanted vaccines. ASK before allowing any vaccine to be administered to your cat. there may be a link between the FVRCP vaccine and kidney inflammation. Please note that kidney disease is the most common subject that I consult on and it is considered by many to be the number one cause - or at least a very common cause - of death in our older cats. The diseases we must commonly vaccinate cats for are caused by viruses - not bacteria. While it is difficult to induce long-term immunity to bacterial infections, vaccines targeted towards viruses are usually more efficient at conferring long-term immunity in the recipient. Please keep this in mind as you read about vaccine frequency below. Membranoproliferative glomerulonephritis possibly associated with over-vaccination in a cocker spaniel. Keep in mind that a vaccine protocol is not a 'one size fits all' issue and that the medical community is lacking in definitive research in many areas of vaccinology. This is why the AAFP and myself make suggestions regarding vaccine protocols - versus etched-in-stone statements. Everyone has a different 'take' on a risk-benefit analysis and people have to work within their own comfort zone. What follows are suggestions that work within my comfort zone. Please do not vaccinate for FIV (Feline Immunodeficiency Virus - aka "feline AIDS"), FIP (Feline Infectious Peritonitis), bordetella, giardia, or chlamydia. Keep in mind that if you do decide to vaccinate for FIV (an adjuvanted, and very ineffective, vaccine), your cat will now test 'positive' since the FIV test cannot tell the difference between an infected cat and a vaccinated cat. Chlamydia vaccines used to routinely be administered but this organism is no longer consider to be a 'core' pathogen. Therefore, vaccination for chlamydia should only be considered in situations where the need can be substantiated through testing. Most people are familiar with the abbreviation 'FVRCP' which stands for Feline Viral Rhinotracheitis (herpes), Calici, Panleukopenia. FVRCP is a combination vaccine that includes 3 out of the 5 vaccines that will be discussed on this web page. This vaccine can either be modified live (all ML vaccines are non-adjuvanted) or killed (adjuvanted). The route of delivery can be either injectable or intranasal. In general, only use a modified live (NON-adjuvanted) - never a killed (adjuvanted) - FVRCP vaccine, with injectable (not intranasal) being the preferred route of administration in most, but not all, instances. Herpes and calici: These are the upper respiratory viruses that can cause watery/swollen/ulcerated eyes (mainly herpes), sneezing, nasal congestion, and oral ulcerations. The severity of illness ranges from very mild to severe but the mortality rate is very low. Unfortunately, as is true for the 'common cold' in humans, there is no 100% effective vaccine for herpes and calici in the cat. One reason is that these viruses mutate (change) frequently and there are many different strains. The vaccine will not prevent infection but will, hopefully, lessen the severity of clinical signs. Panleukopenia: This is a highly contagious virus that infects the intestines causing severe bloody diarrhea and vomiting. This disease has a very high mortality rate. Do not let your kitten go unprotected from panleukopenia. This virus can cause a very cruel death. Vaccinate kittens with FVRCP twice starting at 8-9 weeks of age with the second, and final kitten vaccine, administered when the kitten is no younger than 16 weeks of age. The AAFP guidelines state that you can start this vaccine when the kitten is as young as 6 weeks of age but, unless there is a very high index of risk, I would definitely not vaccinate a kitten this young. The AAFP guidelines suggest giving the FVRCP every 3-4 weeks until the kitten is 16 weeks of age. This is done in an attempt to vaccinate the kitten the minute his maternal antibody level wanes to a low enough level to allow him to respond to the vaccine. That way, there will be a minimal gap between the time his mother's antibodies stop protecting him and the time when he can start making his own antibodies. That said, I would rather not give this many vaccines to a kitten. Unless there is a high index of risk, I prefer to limit it to 2 vaccines total for the kitten series. If you read the AAFP guidelines, there is the potential for administering 4-5 vaccines in the kitten series. Given the fact that the FVRCP vaccine has been proven to cause kidney inflammation (nephritis), I am not comfortable following their suggestions. See Membranoproliferative glomerulonephritis possibly associated with over-vaccination in a cocker spaniel puppy at the bottom of this web page. "In addition, antigens in the complexes were similar to the vaccine antigens in the DHLPP vaccine, suggesting that the glomerulonephropathy in this puppy was secondary to frequent and unnecessary vaccination.". "Further studies are required at this time to determine the role, if any, that recent past and current vaccine protocols play in the development of protein-losing nephropathies." The last statement is very important considering the fact that chronic kidney disease is the most common subject that I consult on and that 2/3 of the kidney cells must be non-functioning before we see any elevation in blood markers such as BUN and creatinine. Therefore, we certainly may be damaging kitten kidneys by giving them 4 vaccines by the time they are 4 months old but not be aware of it. Put another way - if 7 vaccines in 7 months resulted in the death of a puppy, then I am not comfortable with 4 vaccines within 10 weeks for a kitten. The AAFP guidelines suggest giving a FVRCP booster 1 year after the last kitten vaccine - i.e. - when the cat is ~ 16 months of age. However, if the kitten responds as he should to the kitten series, this booster should not be needed. The rationale behind the 1 year booster shot is to cover any kitten that did not properly respond to the kitten series. 1) The last kitten shot was given when he was younger than 16 weeks of age. 4) The vaccine was of inadequate immunogenicity which means that the vaccine was damaged in terms of its efficacy. This could happen due to a problem within the manufacturing process or because of poor handling of the vaccine after it left the manufacturing plant. Note that some cats are genetically 'non-responders' and never will respond to a vaccine no matter how many you give them. In these rare cases, giving a booster vaccine 1 year after the last kitten vaccine would be of no benefit. Deciding to give a booster vaccine 1 year after the last kitten vaccine, or not, is a judgment call. The older a kitten is (past 16 weeks of age) when he receives his last kitten shot, the less inclined I would be to give a booster shot 1 year later. This is because the older he is, the more mature his immune system is - and better able to respond - and the less chance there will be for the maternal antibodies to be at a high enough level to interfere with his ability to respond to a vaccine. Another option would be to test his titer (antibody level) to panleukopenia (not herpes or calici) to help you make a decision. (More on titer testing below.) This is what I would personally opt for. I do not repeat the FVRCP vaccine past the kitten shots - or past the 1-year booster as discussed above. We certainly must stop vaccinating with FVRCP every year but taking it one step further, I do not follow the AAFP guidelines which suggest giving the FVRCP every 3 years since the risks outweigh the benefits. 1) A single, properly-timed, FVRCP vaccine confers life-long immunity to panleukopenia (the most serious disease among the 3 that the FVRCP targets) in the vast majority of cats. Those very few cats that may not be protected are considered to be 'non-responders' and giving them more vaccines is unlikely to help. 2) Herpes and calici vaccines lack the ability to induce complete protection. At best, they will only reduce the severity of some symptoms but will not prevent infection with these viruses and will not protect the recipient from all symptoms of disease. 3) Herpes and calici viral infections do not have a high mortality rate. Death from these viruses is extremely rare and, if it did occur, it would most likely happen in kittenhood. 4) Even though a non-adjuvanted FVRCP vaccine is much less likely to cause a sarcoma, sarcomas have been noted with these vaccines. 5) The FVRCP vaccine has been shown to cause kidney inflammation. Given how common chronic kidney disease is in the cat, this fact influences my vaccine decisions. If you rescue/adopt an altered (spayed/neutered) adult with an unknown vaccine history, I strongly suggest running a titer for panleukopenia rather than vaccinating blindly. If the cat is spayed or neutered, chances are she or he was vaccinated as a kitten. However, the age at which he received his last kitten vaccine (past 16 weeks of age?) will not be known so the decision to administer a vaccine, or not, is a judgment call. This is a situation where titer testing can help out. As odd as it may sound, if I rescue a neutered adult male cat with a fairly good size (empty) scrotal sac, I assume (rightly or wrongly....) that he was most likely not neutered before the age of 16 weeks. (Male cats that are neutered very young have a very flat scrotal sac.) Given that most cats are vaccinated when they are neutered, this gives us a hint (and nothing more than that) that the cat may very well have received a vaccine past the age of 16 weeks. Also, keep in mind that many of these stray cats have been 'travelling the streets' and may have a good dose of natural immunity to some feline diseases although that cannot be counted on definitively. The AAFP guidelines call for a series of 2 FVRCP vaccines to be given 3-4 weeks apart to an adult with an unknown vaccination history but the WSAVA (World Small Animal Veterinary Association) recommends that only 1 FVRCP vaccine be given with a booster vaccine 1 year later. In lieu of this 1 year booster, I would suggest titer testing. Studies have shown that cats over 16 weeks of age with a healthy immune system respond very well to just 1 FVRCP vaccine. Feline leukemia (the disease that results from the feline leukemia virus versus a primary cancer), is a complicated disease. It typically attacks the bone marrow of the cat but cats vary in their response to the virus. Some cats clear the virus from their system and become FeLV 'negative', some cats live for many years with the virus in their body but are not symptomatic, and some cats become ill and die within a few years of becoming infected. FeLV is NOT highly contagious and its transmission requires prolonged intimate (i.e., sharing food/water, mutual grooming) contact with an infected cat. Natural immunity is very strong in most cats by the age of 1 year. AAFP guidelines suggest vaccinating all kittens but the vaccine is recommended in adults only if they will be in contact with a known FeLV positive cat - which would be a very rare situation. I disagree with the recommendation to vaccinate all kittens. None of my own cats have ever been vaccinated for FeLV - not even as kittens - since they reside indoors and will not be in contact with a FeLV positive cat. Do not vaccinate kittens for FeLV unless your kitten is going to be outside (rarely a safe place to be for any kitten or cat) or is going to be housed with an FeLV positive kitten or cat. Do not vaccinate adult cats for FeLV - even if they have access to the outdoors - since natural immunity to this disease is very strong by the time the cat is ~1 year of age. If an adult cat is going to be living with a FeLV positive cat, then vaccination should be considered. If you are more comfortable vaccinating a cat that goes outside, please do not vaccinate him yearly. Vaccinating one time with a PureVax (the only NON-adjuvanted option) vaccine would fit within my comfort zone. This is a very serious disease with narly 100% mortality in animals and humans. (Only a handful of people have survived a rabies infection.) Since humans can contract rabies from animals, including cats, vaccinating cats for rabies is required by law in some areas of the country. Any cat that is exposed to the outdoors, or any indoor cat that could possibly come in contact with a bat, should be vaccinated for rabies. Bat rabies is the most common strain to infect humans. Bats can live in attics, fly down chimneys, come in through windows, and 'indoor-only' cats have been exposed to rabid bats on balconies, as well as within their own home. 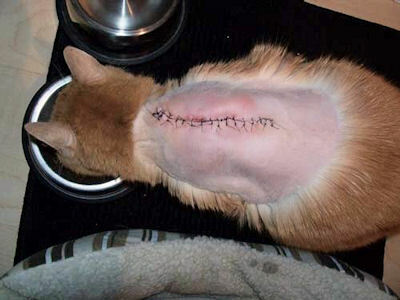 To reiterate what has been said elsewhere on this webpage, I would never inject an adjuvant into any cat in my carebecause of the increased risk of an injection site sarcoma (very aggressive, and usually fatal, cancer). Fortunately, there is one line of non-adjuvanted rabies vaccine available and that is Merial's PureVax rabies vaccines, but it is important to keep in mind that sarcomas have occurred at the site of PureVax vaccines so we want to be mindful of the frequency that even this vaccine is used. The choice is very clear to me - I will be using/recommending the PurVax 3-year product going forward. Many veterinarians are choosing not to carry the PureVax line (either the 1-year or the 3-year rabies vaccine, or the PureVax FeLV vaccine) because PureVax products are much more expensive than adjuvanted vaccines. Many veterinarians practicing in low-income areas or in animal shelters on limited budgets are still using the more inflammatory adjuvanted rabies vaccines. Many colleagues who do use the PureVax line are refusing to carry the 3-year product and will continue to only carry the 1-year product. 2) veterinarians are concerned that if they move their feline patients to the 3-year product the cat will not be brought to their clinic for yearly exams. This is a legitimate concern since our cats cannot speak and warn us of health problems early on. Dental disease is a major problem among cats that 'flies under the radar,' going unnoticed until significant disease is present. With regard to #1, the money out of the client's pocket will be no different in the long run. If the 3-year product costs 3x more than the 1-year product but you only pay for every 3 years, the overall cost is the same as if the client opted for getting their cat vaccinated every year. I always take the opportunity to conduct an oral exam on a patient's mouth whenever possible. 2) visit the Dental Health sections on my Feeding Your Cat and Making Cat Food web pages. Cats, like humans, vary greatly in their propensity for forming tartar and in their overall dental health status. Some cats need to have their teeth cleaned (under general anesthesia) yearly, yet others may be fine with cleanings every ~ 2-3 years. I do not support anesthesia-free dental 'cleanings' since it is not even remotely possible to adequately take care of a cat's (or dog's) dental needs while they are awake. 1) Unvaccinated, at-risk cats can transmit a dealy disease to humans. 2) If your cat is not vaccinated for rabies (i.e., legally current) and they come in direct contact with a wild animal that is not available for rabies testing, quarantine for up to 6 months may be required. How strictly this is enfoced varies from state-to-state, county-to-county and I will note that there has been a recent move in some counties to reduce that time. My own cats are not vaccinated for rabies since I live in an area where rabies is not common, my cats have never been outside and never will step 'paw' outside, and I am confident that a bat cannot enter my home. My cats are also not allowed out on a balcony due to 'high rise syndrome' ... ie... it is very common for cats to fall off of balconies resulting in death or severe injury. If your cat has significant health issues and you live in an area where rabies vaccination for cats is mandatory, discuss a health waiver with your vet. Keep in mind that only healthy cats are to receive vaccines and it states as such on every bottle of every vaccine. That said, the word "healthy" is up for individual interpretation and health waivers are very rarely issued. Of course, any unvaccinated cat needs to remain indoors at all times and any possible opening that a bat could enter needs to be addressed. "PUREVAX Feline Rabies 3 YR is recommended for the vaccination of healthy cats 12 weeks and older for prevent of disease due to the rabies virus. A 1 year booster vaccination is required after primary vaccination, followed by a vaccination every three years." If a kitten is in a high risk situation (e.g., feral kitten that is to be released following TNR [trap, neuter, return] protocol, or is living outside for any other reason), they can be vaccinated as early as 8 weeks of age. However, in this case it is possible that the vaccine will not confer complete immunity if the kitten's mother had high levels of rabies antibodies that she passed on to her kitten (probably an extremely rare scenario). Merial states that if a kitten is vaccinated at 8 weeks of age, they should receive another vaccine at 12 weeks of age, but this is obviously not going to happen with a feral kitten that is TNR (trapped, neutered, returned). In a TNR situation of an 8 week old kitten that was to be returned to the colony, I would not hold this kitten for another 4 weeks, nor would I stress him/her with re-trapping. I would vaccinate them just the one time and note the kitten's age in the medical record. Keep in mind that the older a kitten is when they are vaccinated (with any vaccine), the more efficiently their immune system will be able to respond. Therefore, I would prefer to wait until the kitten is at least 16 weeks of age before receiving a PureVax rabies vaccine. Of course, the kitten needs to be kept indoors at all times until they are properly vaccinated but preferably for the rest of their life since the death rate for outdoor cats is significantly higher than it is for indoor cats. They appear to be most commonly associated with vaccine adjuvants but can also form at the site of any injection that causes local inflammation. That said, even though injected substances other than adjuvants can cause sarcomas, these tumors were relatively rare prior to the advent of adjuvants. Adjuvants are substances that are added to vaccines to purposely cause inflammation at the vaccine site in order to alert the immune system to its presence. They are used with killed vaccines to stimulate a more robust immune response. Other injections which may incite local inflammation include (but are not limited to) the non-adjuvanted, modified live FVRCP vaccines, the PureVax line of vaccines (all are non-adjuvanted), and drugs like Program (for fleas), Droncit (for tapeworms), and Convenia (an injectable long-acting antibiotic that is being over-used and abused). The discovery that vaccine adjuvants can cause sarcomas led to the acronym VAS (Vaccine Associated Sarcoma). However, instead of VAS, we are now using the acronym "ISS" (Injection Site Sarcoma) because, again, sarcomas can form in response to anything that causes inflammation of the area under the skin. This is why I carefully weigh out my options before injecting anything into a cat - given their tendency to develop cancer at the site of any inflammation - if there is a safer alternative. See this article on Convenia. I highly suggest that you never allow it to be injected into your cat. Sarcomas need to be quickly and aggressively treated - at great expense - if one is to try to save the patient's life. Do not assume that your veterinarian uses non-adjuvanted vaccines. ASK - before allowing any vaccine to be injected into your cat. 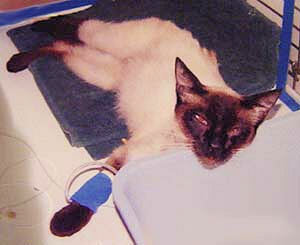 "Chicken" is a special kitty that ended up with a VAS after an adjuvanted rabies shot was given in the scruff area. In addition to aggressive surgery, she had to go through radiation and chemotherapy treatments (>$10,000). This picture was taken 12/2/10 after the bulk of the tumor was removed. Please note that these are very aggressive tumors with 'tentacles' that run deep into the tissues. Therefore, it is almost impossible to remove the entire tumor. Click here to follow Chicken's blog. Update: Sadly Chicken passed away on 12/17/11 from a saddle thrombus which is a blood clot in the aorta. Please note: NO vaccine (adjuvanted or non-adjuvanted) is to be given in the scruff area under any circumstance.They are to be given as low in a limb as possible. This is to allow for limb amputation if a VAS occurs. In 1997, the AVMA (American Veterinary Medical Association) came out with the strong recommendation to never use the scruff area for vaccines. Evidently, the veterinarian who administered Chicken's adjuvanted rabies vaccine either did not take this recommendation seriously or was not keeping up on his continuing education. In addition to using the wrong location, an adjuvanted used instead of PureVax and Chicken is paying a high price for these careless decisions. As already mentioned, this is the most common subject that I consult on and it is upsetting to see so many domestic cats end up dying from kidney disease when it is not that prevalent in wild cats. I understand that cats in the wild do not typically live as long as our little furry buddies but I still cannot accept that natural aging is the only factor involved in this disease process. Why do so many cats end up in kidney failure? The answer - or at least, part of the answer - may lie in the fact that we have been over-vaccinating cats for many years. Studies have demonstrated an association between the FVRCP vaccine and interstitial nephritis which is the fancy term for kidney inflammation. "The Center for Companion Animal Studies at Colorado State University has shown that cats vaccinated with FVRCP vaccines grown on Crandell-Rees Feline Kidney (CRFK) cell lines can develop antibodies to renal (kidney) proteins, and that cats hypersensitized to CRFK cell lysates can develop interstitial nephritis. The immunodominant antigens to which antibodies are formed in these cats are α-enolase and Annexin A2, both of which are linked to autoimmunity and renal disease in humans. 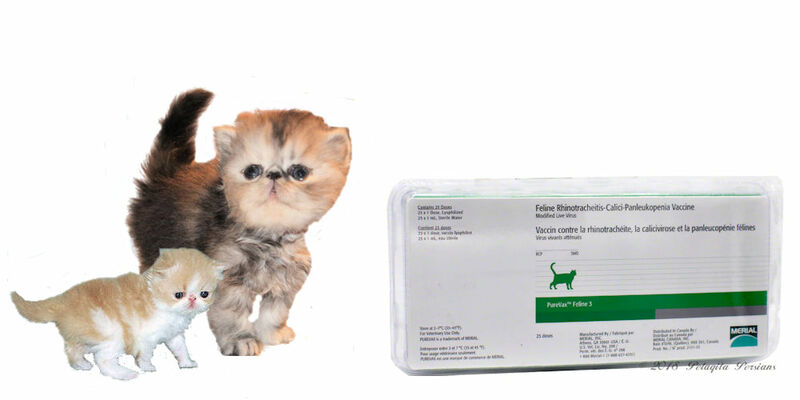 Recently, we have shown that cats administered FVRCP vaccines parenterally (i.e. injectable) have higher levels of circulating antibodies to these antigens than do cats who were administered a FVRCP vaccine via intranasal administration." The viruses used to make vaccines need to be grown in what is called a "cell culture". The cells used to make the FVRCP vaccine are feline (cat) kidney cells. Most people have heard of Lupus. Lupus is an autoimmune disease most commonly seen in humans. In essence, the FVRCP vaccines have the potential to stimulate a Lupus-like reaction in the recipient. More studies are needed to determine what role vaccines may play in causing or contributing to feline kidney disease. An allergic reaction, in simplistic terms, it is an overreaction by the immune system to a foreign substance that enters the body. An anaphylactic reaction is a very severe allergic reaction that affects the entire body and is life-threatening - even if treated promptly. The typical 'shock' organ of the cat is the lungs. If the reaction is severe enough, the signs can include coughing, difficulty breathing, coughing up blood, collapse, and death. Another 'shock' organ of the cat is the intestinal tract. Cats can exhibit mild to severe vomiting and diarrhea - sometimes bloody. Other serious reactions can involve blood vessels (vasculitis), red blood cells (Immune Mediated Hemolytic Anemia), platelets (Immune Mediated Thrombocytopenia), and any organ of the body. 'Milder' allergic reactions can cause a swollen face, swollen limbs, and itching. Foreign substances that can cause allergic/anaphylactic reactions include all vaccines, all drugs, foods, etc. Vomiting, diarrhea, lethargy, fever, anorexia, lameness, neurologic abnormalities, local swelling and soreness at vaccine site. All of these negative clinical signs can be seen secondary to the administration of vaccines. All killed vaccines are adjuvanted and may cause malignant tumors. All FeLV vaccines, except for the PureVax vaccine, are killed. Some FVRCP vaccines are killed. Killed vaccines do not stimulate the immune system as efficiently as modified live vaccines. MLV stands for Modified Live Virus. They are all NON-adjuvanted. The viruses contained in these vaccines are not killed but are attenuated (blunted) so that they will replicate in the recipient but, hopefully, will not cause disease. Most, but not all, FVRCP vaccines are modified live. 'Reverting to virulence' means that the virus contained in the vaccine is now infective enough to cause disease. This is a rare risk of using MLV vaccines. Note: In 1999, I was involved in a situation where several kittens in a group died from panleukopenia post vaccination with a MLV FVRCP vaccine. The vaccine was from a leading vaccine manufacturing company and after speaking with their head veterinarian, it was determined that the vaccine may have reverted to virulence. This means that the vaccine could have caused the very disease we were trying to protect these kittens from. Since MLV vaccines do carry this (extremely rare) risk, as well as having the potential to incite kidney inflammation, I try to limit the kitten series to 2 MLV vaccines. 1) The route of infection for panleukopenia is oral, not via the respiratory tract. Intranasal vaccines are better at conferring immunity for respiratory viruses and are less effective than an injectable MLV for stimulating immunity to panleukopenia. I would never count on an IN vaccine to fully protect a patient from panleukopenia. 2) There are no DOI challenge studies for panleukopenia post-intranasal vaccination like there are for the MLV vaccines. 3) Even though they may be more efficacious for the herpes and calici viruses, they often cause sneezing and watery eyes and the owner needs to be aware of this. Our rescue group tried using these vaccines and it was a disaster because our kittens had to sit out from adoptions for about 2 weeks due to sneezing and watery eyes. 4) On a positive note, intranasal vaccines cannot cause a Vaccine Associated Sarcoma and they have been shown to cause NO kidney inflammation. However, even in light of these 'pluses' I am not comfortable using them to protect kittens against panleukopenia. 5) In some situations (catteries and shelters with a severe herpes/calici problem), the IN vaccine that contains only the herpes and calici viruses but not panleukopenia virus is of value since it stimulates a local mucosal (the lining of the respiratory tract) immunity very quickly and is not affected by maternal antibodies. Therefore, it can be given to kittens younger than the traditional 8 weeks of age. Merial's PureVax rabies (1 ml dose) and feline leukemia (0.25 ml dose) vaccines are recombinant vaccines which means they contain only a portion of the genetic material of a pathogen (virus). Therefore, reversion to virulence (able to cause disease) is impossible. The PureVax FeLV vaccine uses a very low volume (0.25 ml) and it is injected intradermally (within the skin) versus under the skin. Although I have not seen any literature on the negative reaction rate, I am going to assume that the recombinant vaccines will be less apt to cause an anaphylactic reaction because they contain fewer potential allergens. They also do not replicate in the recipient and there is no reason to believe that they cause kidney inflammation. To clarify: Merial makes a PureVax FVRCP vaccine but it is not a recombinant product. It is a modified live vaccine (non-adjuvanted) just like other manufactures make. Recombinant vaccines appear to be the safest type available. While they can cause sarcomas, they are less likely to do so when compared to a killed/adjuvanted vaccine. Let's start with the last one - the owner's comfort level. This certainly does not sound like a very scientific factor but it is an important issue to consider. Given the fact that all foreign substances do have side effects when introduced into any living being, I would be a hypocrite if I did not mention the owner's feelings since my own comfort level is tested anytime I decide to inject anything into the body of my own cats or that of my patients. Now having said that, we can't throw the baby out with the bath water and not vaccinate at all otherwise, our cats (and possibly their humans in the case of rabies) may suffer for it. Age of the patient: Maternally-acquired immunity is an important concept to understand. When a kitten nurses from his mother, the first milk that she produces (colostrum) is rich with antibodies to fight the various diseases that the mother has been exposed to either naturally from her environment or from any vaccines that she has received prior to giving birth. Therefore, the last vaccine in the 'kitten series' should be given when the kitten is at least 16 weeks of age. Current conventional protocol states that you can start to vaccinate kittens as early as 6 weeks of age but it would be a very rare situation that would cause me to start vaccinating a kitten at such a young age. I find that most kittens that are presented for vaccination are kept indoors and are well-isolated from disease. If the kitten resides in a protected indoor environment, I feel comfortable starting the vaccine series later than the conventional protocol calls for. This means that I may not start a kitten's vaccines until he is ~9-10 weeks of age, with the second vaccine given at 16 weeks of age. Keep in mind that even though my barn cat is outside and technically has a higher risk of exposure, given the duration of immunity of the panleukopenia vaccine, he is not vaccinated with FVRCP any more frequently than my indoor-only cats. Prevalence of the disease: The most important disease to consider under this heading is rabies; its geographic prevalence varies widely. Health of the patient: Vaccines are to be administered only to healthy patients. Previous vaccine reactions: All past vaccine reactions - no matter how minor - must be taken into consideration when making future vaccine decisions. Under most circumstances, I will not re-vaccinate a patient that has had an allergic reaction since the next time may bring on a more serious reaction. Vaccine efficacy: Vaccines vary in their ability to confer strong immunity within the patient. Some vaccines, such as the FIV (Feline Immunodeficiency Virus) vaccine are not very effective at stimulating immunity in the recipient. In addition to this issue, the FIV vaccine is a killed product which means it contains an adjuvant. Therefore, it should not be administered to any cat, in my strong opinion, due to the risk of VAS. As noted above, Herpes and Calici vaccines are also lacking in the ability to induce complete protection. At best, they will only reduce the severity of some symptoms but will not prevent infection with these viruses and will not protect the recipient from all symptoms of disease. The risks of repeated vaccination outweigh the benefits in most situations. Duration of immunity (DOI): The duration of immunity (how long a vaccine protects the recipient) varies with each disease/vaccine and, of course, with each patient. However, one vaccine that we do have strong data for is the panleukopenia vaccine which is a very good thing considering how contagious this fatal disease is. From two different studies, we know that the panleukopenia vaccine confers immunity for at least 7.5 years (the study was stopped at that point) and most immunologists feel that the vaccine lasts for life in the vast majority of cats. If a cat falls into the rare category of not being protected for life, it is thought that this cat is a 'non-responder' and would fail to respond even if further panleukopenia vaccines were given. All that said, panleukopenia is a nasty disease and if I had a cat that was going to be exposed to, for example, foster cats and that cat had not been vaccinated for panleukopenia within the previous 8-10 years, I would at least check his titer. Or, better yet, do not allow the cat to be exposed to other cats of unknown vaccination/infection status. Vaccine properties: As I have stated many times, do not ever use adjuvanted vaccines. Titers: Note that titer testing is only done for panleukopenia and rabies(for international shipping) and not for herpes and calici. Think of the immune system as a 'gun' and antibodies as 'bullets' for the gun. A titer measures the amount of antibodies for a specific disease that are currently circulating in the blood stream of the body. This sounds like a great test but the information we get from titer testing is only part of a much bigger picture. Notice that I emphasized the word "current" in the paragraph above. This is because of 'memory cells' which are cells in the body that titer testing cannot measure. Memory cells are primed by a previous natural exposure or vaccination to a pathogen (virus, bacteria, fungus, etc.) and are ready to quickly (within hours) produce more antibodies the moment the body is exposed to the invader again. These cells do not produce antibodies - and therefore, do not contribute to the titer level - until the body is attacked by the pathogen. Antibodies are not the only type of 'bullet' that the immune system uses. There is another type of 'ammunition' called cell mediated immunity (CMI) which is a very important arm of the immune system that, unfortunately, we cannot measure with any commercially available test - including a titer test. Given the above, it is obvious that titer testing has some severe limitations when being used to assess the status of a patient's immune system. If a titer is low, that does not necessarily mean that the patient is unprotected. If he has a lot of memory cells standing by waiting, he is considered to be well-protected against diseases that are best eliminated with a quick antibody response. So when may titer testing be helpful? If an UNaltered stray cat ends up on your doorstep, chances are that he or she has not been vaccinated - and should receive a vaccine now. If a cat shows any titer at all, this means that he has either been vaccinated in the past (and responded to that vaccine) or he has been naturally exposed to the disease. According to the World Small Animal Veterinary Association Vaccine Guidelines Group (WSAVA-VGG), a positive test result would lead to the conclusion that revaccination is not required. Note that a low (versus high) titer does not necessarily mean the cat is unprotected since memory cells and cell mediated immunity are, in all probability, present in full-force. This is very important to understand because the advent of titer-testing has led to unnecessary revaccination of many patients just because they came up low on their titer test. A negative titer means that the cat may, or may not be, protected. The WSAVA-VGG recommends vaccinating these cats while acknowledging that these patients may be fully protected and not need to be vaccinated. They are, understandably, taking a 'better safe than sorry' approach since panleukopenia is such a serious disease. If a cat with a negative titer is subsequently vaccinated (with a properly manufactured and handled vaccine) and has his titer re-checked with another negative result, this patient would fall into the 'non-responder' category and should not be vaccinated again. I wish that I could tell you that there are straight-forward, clear-cut answers for all decisions involving the vaccination of our cats but there are simply too many variables involved to make this a reality. In closing, I would like to see less money being spent on over-vaccination of our cats and more money being spent on dental health care which will be the subject of my next web page. Preview: Please consider brushing your cat's teeth since it is the very best way to maintain their dental health. And please do not subject your cat to anesthesia-free dental cleanings which provide very little benefit since the problems are under the gum line and these 'awake' cleanings only serve to stress your cat and your pocketbook for very little, if any, benefit. These anesthetic-free cleanings simply result in is a false sense of security leading the cat owner to believe that they have adequately addressed their cat's dental needs. I put some text in bold. Please note that Dr. Ron Schultz is one of the leading experts in immunology and is highly respected. J Comp Pathol. January 2010;142S1(0):S102-S108. 1 Department of Pathobiological Sciences, School of Veterinary Medicine, University of Wisconsin-Madison, Madison, Wisconsin, USA. Vaccination can provide an immune response that is similar in duration to that following a natural infection. In general, adaptive immunity to viruses develops earliest and is highly effective. Such anti-viral immune responses often result in the development of *sterile immunity and the duration of immunity (DOI) is often lifelong. In contrast, adaptive immunity to bacteria, fungi or parasites develops more slowly and the DOI is generally short compared with most systemic viral infections. Sterile immunity to these infectious agents is less commonly engendered. * Dr Pierson's comment: "Sterile immunity" refers to the immune system preventing infection with the offending agent. "Non-sterile immunity" refers to the fact that the pathogen can still infect the body (herpes and calici, for instance) but the clinical signs will not be as severe in a vaccinated animal when compared to an unvaccinated animal. End comment. Old dogs and cats rarely die from vaccine-preventable infectious disease, especially when they have been vaccinated and immunized as young adults (i.e. between 16 weeks and 1 year of age). However, young animals do die, often because vaccines were either not given or not given at an appropriate age (e.g. too early in life in the presence of maternally derived antibody [MDA]). More animals need to be vaccinated to increase herd (population) immunity. The present study examines the DOI for core viral vaccines in dogs that had not been revaccinated for as long as 9 years. These animals had serum antibody to canine distemper virus (CDV), canine parvovirus type 2 (CPV-2) and canine adenovirus type-1 (CAV-1) at levels considered protective and when challenged with these viruses, the dogs resisted infection and/or disease. Thus, even a single dose of modified live virus (MLV) canine core vaccines (against CDV, cav-2 and cpv-2) or MLV feline core vaccines (against feline parvovirus [FPV], feline calicivirus [FCV] and feline herpesvirus [FHV]), when administered at 16 weeks or older, could provide long-term immunity in a very high percentage of animals, while also increasing herd immunity. Ortloff A, Moran G, Olavarria A, Folch H. J SMALL ANIM PRACT 51:499-502, 2010. This report described a clinical case of membranoproliferative glomerulonephritis (MPGN) in a young dog. The 7-month-old male cocker spaniel presented to the veterinary clinic with vomiting, diarrhea, lethargy, and anorexia. The puppy had been previously healthy with no prior disease, drug treatment, or toxin exposure. However, the puppy had been vaccinated by the owner (without veterinary direction) a total of 7 times (once per month) with a distemper/hepatitis/leptospirosis/ parainfluenza/parvovirus (DHLPP) vaccine. The puppy was severely dehydrated on clinical presentation and demonstrated pale mucous membranes, oral ulcerations, halitosis, and abdominal pain. Several diagnostic procedures were performed, and ultrasonography revealed loss of renal architecture, increased cortical echogenicity, and bilaterally decreased kidney size. Complete blood count and serum biochemical values were consistent with renal diseas, including anemia, severe azotemia, hyperphosphatemia, and hypoalbuminemia. Urine culture was negative. The puppy was aggressively treated for renal failure, including peritoneal dialysis, but died 3 days after hospital admission. Necropsy was authorized, and revealed ascites, retroperitoneal and abdominal edema, small pale kidneys, and kidney morphologic changes consistent with glomerulonephritis. Electron microscopy and immunohistochemical testing demonstrated the presence of deposits in the glomerular subendothelial spaces and the basal membrane; this was consistent with antigenantibody immune complexes. In addition, antigens in the complexes were similar to the vaccine antigens in the DHLPP vaccine, suggesting that the glomerulonephropathy in this puppy was secondary to frequent and unnecessary vaccination. Commentary: Although membranoproliferative glomerulonephritis is reported as 1 of the most common glomerulopathies in dogs, a definitive diagnosis and identification of the offending antigen are rarely identified due to the risk and expense associated with renal biopsies and electron microscopy. This case report demonstrates that injudicious use of vaccinations may, like other infectious or autoimmune diseases, lead to immune complex deposition and subsequent glomerular damage. When possible, appropriate education should be provided regarding the rationale for current vaccine guidelines to avoid overvaccination.